Touch of Wood laser engraving and Elite Engraving and Awards has launched an E-Commerce web site, TouchOfWood-2, as a means of offering our customers the convenience of a secure, online shopping experience. We are using Big Commerce as our web site host. Big Commerce offers all the tools to provide a clean, easy to use secure shopping experience for our customers. Our catalog currently has limited offers, but over the next several months we will expand our catalog with a wide range of custom engraved products to meet our customers needs. We are using PayPal for online purchases. Don’t have a PayPal account? Not to worry, Pay pal will let you checkout using your Credit Card without a PayPal account. Your transaction details will be handled by PayPal, we will never have your account information, further securing your finical information. Safe, secure check out and the quality and service every customer of ours receives. Our customers… that’s a small but very important word to us. We started our business in 2000 with the goal of providing the best in quality and service. I believe we have risen to the occasion as we so often hear that we have exceeded our customers expectations… we can’t express how much this means to us and we promise never to lower our standards. From single piece orders to short production runs… How may we help You? The Americans with Disabilities Act requires new construction of public accessible facilities to comply with the new laws by March 12,2012. As an example, resorts, hotels, hospitals, entertainment venues and college campuses to name a few, are required to comply with the ADA laws. Elite Engraving is pleased to offer ADA signs with tactile text and grade 2 braille that comply with the laws and are designed to complement your design and decor. 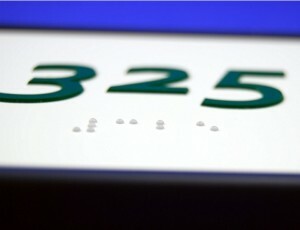 We’ll guide you through the design and creation of ADA signs which comply with the new laws. A wide range of options are available from the choice of your colors and design considerations. Hanging options include simple double sided tape to frames in a range of materials and finishes. fabricators and facility managers. We would like the opportunity to talk with you about your projects and requirements. Our engraving shop works closely with our customers to insure a quality product that meets your needs and expectations. 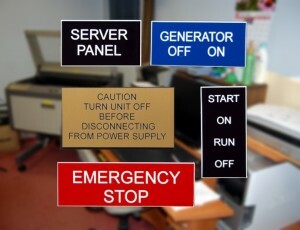 but not to worry, we’ll take care of the technical details for you! The new ADA sign specifications require the Braille to be dome shaped and raised above the surface .025 to .037″. 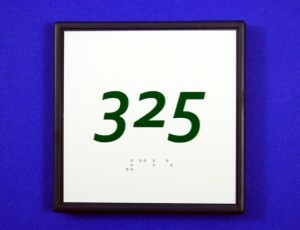 The new tactile text specifications call for beveled edges and that the text also be raised above the surface. 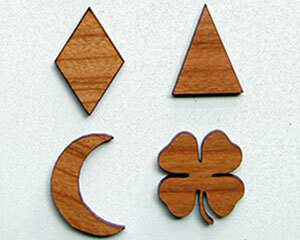 as can be seen in the image on the right above. Text size is dictated by the size of the sign. The background and text must contrast, the colors can’t be similar and the sign must be non glossy. The law also specifies the placement and height for ADA signs for various uses and locations, which is too involved to get in to here. Not all signs need to be ADA compliant, temporary signs, building addresses, directories and parking signs are exempt to name a few. Thanks for taking the time to read our post, we hope this has been helpful and informative. using a Forester bit and a drop of glue in to your project, as a promotional tool, engraved on both sides, as a gift tag or business card! The one inch token can be attached to a letter and mailed for no additional postage! Uses are almost endless, what’s your idea? for your designs, adding engraving to complete your prototype or project. 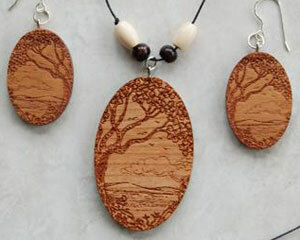 Cut and Engraved Necklace and Earrings, but could be a custom tag of your own design. We would be happy to discuss your project with you. together offer a full line of products and and engraving options. Explore our web site, if you don’t see what you are looking for, Contact Us and we’ll see what we can do to help you. The Laser Pointer is daylight bright, nice for pointing out an area or to something hard to zoom in on, just point the laser and problem solved, time saved. The 4 GB USB Drive is so handy for capturing data and having it handy whenever you have your Laser Pointer, and oh ya, it has a Ball Point pen right there when you need to jot a quick note or thought down, real handy. The Laser Pointer turns on with a simple push on switch in the pen barrel, let go and the laser turns off, very safe. The USB Jump Drive is protected with-in the body of the pen, the pen unscrews to access the USB connector, very simple, protective and handy. Our new Laser Pointer includes a 4 GB Jump Drive and Ballpoint Pen all in one package. 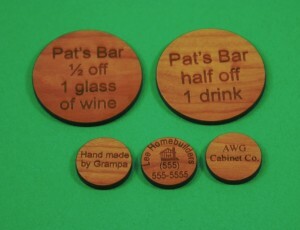 We’ll include 1 free line of engraved text with your purchase. 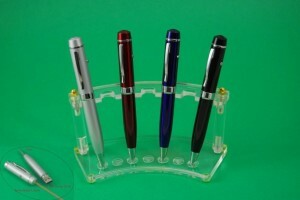 Check out our Touch Screen Stylus and Ballpoint Pens! Available in a choice of colors or Bamboo! 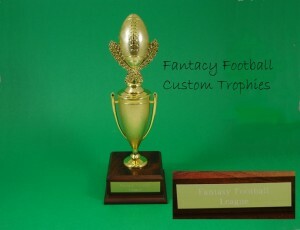 Let us create the trophy that will have everybody talking. We aren’t talking just any trophy, we’re talking about that one-of-a-kind trophy for you. We have a wide selection of trophy tops and bases, or, you can supply your own unique parts and we’ll build your fantasy trophy. We like to say you are only limited by your own imagination! Click Here for complete contact information or with any further questions you may have. Click Here for our Quote Form and Contact Ann and lets see what she can do for you we’ll help get the (Foot)Ball rolling! Our quote include all costs, no little fees for this and that. Your one stop shop for all your engraving needs. 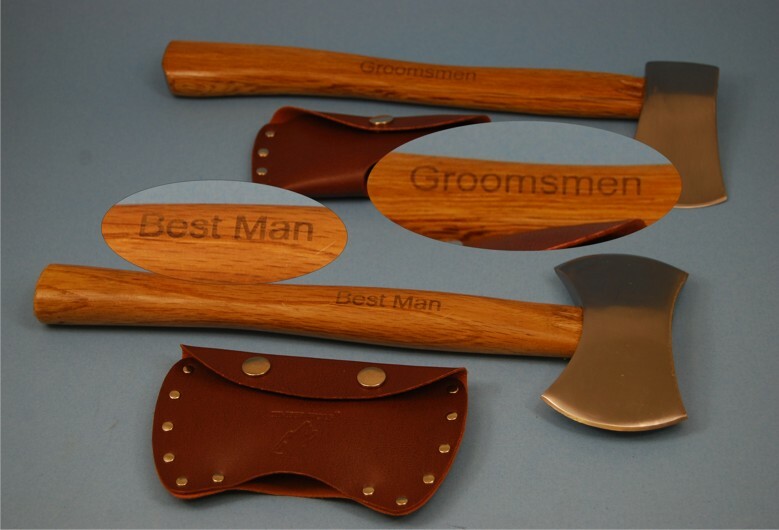 The Wedding days closing in, you need groomsmen gifts…What’s a guy to do? Groomsmen Gifts, Laser Engraved Axes, recipient’s name engraved on the other side. In days past, things seemed simpler, everything seems to be going out of control… whew. It’s not that bad. Seems our customers can be quit creative. Here we are showing axes brought to us for engraving with the mans name on one side and the service he preformed on the other side. We’ve also done machetes, Leather-man knifes, hunting knifes, pens (an old standby), flasks ( another oldie) and personal items from the couple that we engraved for them. A common question is, “Can you engrave this?” or “Can this material be engraved?” and ” I only have one piece, will you engrave it”? We will engrave a single piece to short production runs. We are pleased to add Machine Tags Made to Order to our Catalog … Machine Makers, Mechanics, Hobbyists; Professional quality machine tags , both indoor and outdoor rated plastic tag material. Single piece to short production runs. All work is done in-house, ensuring internal quality control and personal service with your project. Machine Tags start from $2.50 for a 3/4″ X 1″ engraved tag, double sided tape included. We offer materials , surfaces and engraving to your project specifications, ensuring the look and feel needed for your project. Brass Tags also available, Contact Us for further information. Contact us with your general questions or Request a Quote for your project.